With instability in the stock market and concerns over the future of the economic expansion, what should business leaders expect in 2019 and beyond? 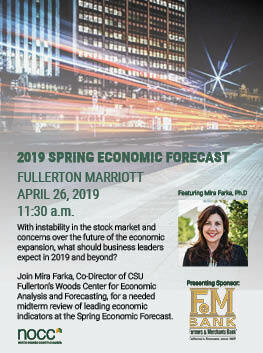 Join Mira Farka, Co-Director of CSU Fullerton’s Woods Center for Economic Analysis and Forecasting, for a needed midterm review of leading economic indicators at the Spring Economic Forecast. From the housing market to world trade, the event will add expert perspective to the headlines, with a focus on the likely outcomes for the next three years. Attended by professionals from a wide range of industries, the event is also a great place to network and build connections.